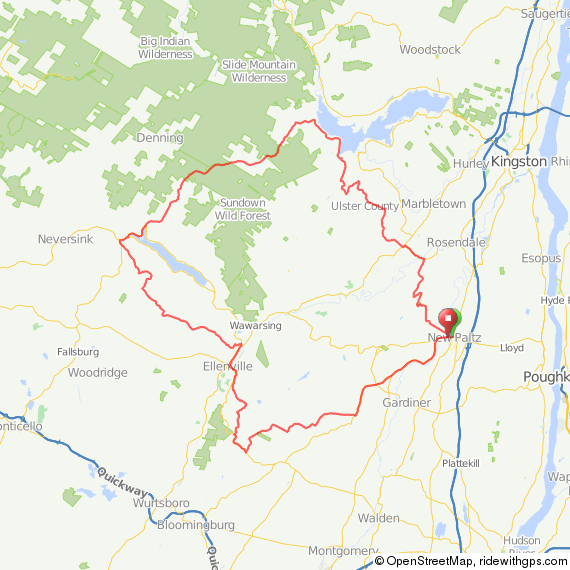 Last week, a reader asked me for advice on a killer route that would take him over several of the major climbs in the area, starting from New Paltz. He didn’t ask me to create GPS for him, in fact, he already had a good route in mind, but because I have an obsession with maps, I put together three options for Peekamoose. First, a warning: These routes will challenge even experienced riders. 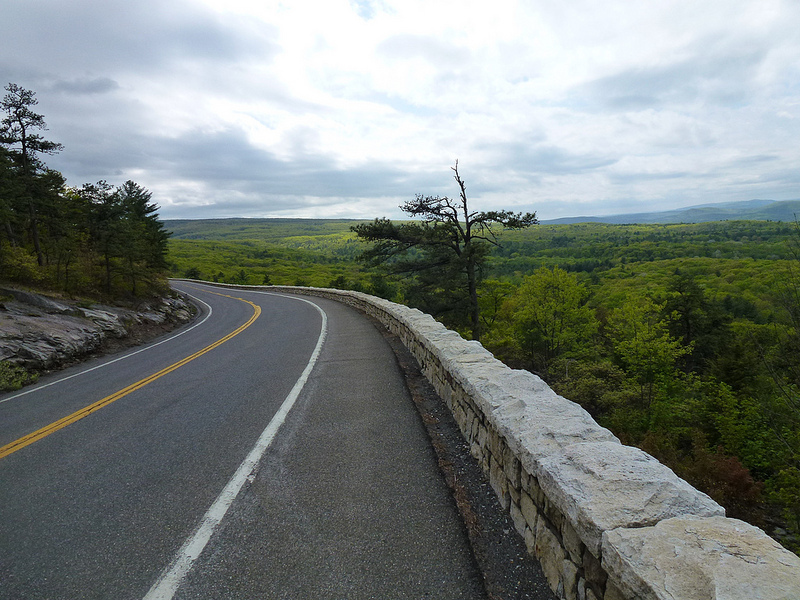 Two of them include three of the finest climbs in the Catskills and Shawangunk Ridge, and one includes an additional climb which is well worth your time. If you’re an experienced rider looking for a capstone ride for your summer, one of these will fit the bill nicely, particularly if you want something in the century range. Second, I obviously took these pictures at different seasons, and across several years. So think green! Let’s get this party started by getting you from the train station in Poughkeepsie to the starting point in New Paltz. 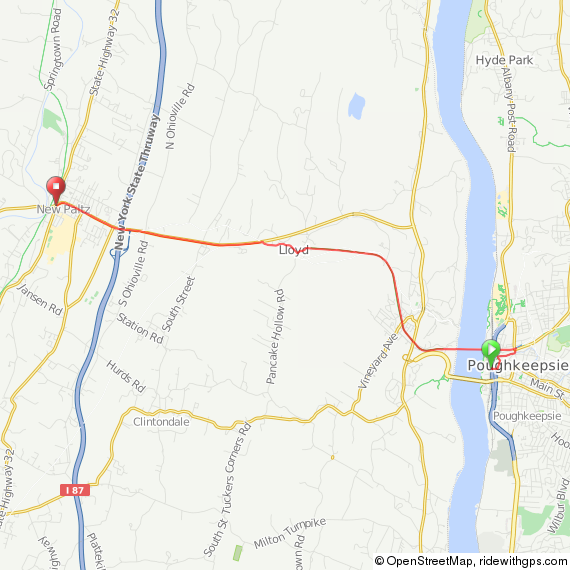 Don’t consider this part of your ride—it’s extremely fast with minimal effort, and it takes you on a bike path out of Poughkeepsie to Route 299. There is considerable traffic on Route 299, but the shoulder is wide, so it is safe. Is it the prettiest way to get to New Paltz? No, but it’s the fastest way to get to the good stuff. This is what the route looks like, and the GPS can be found here. Don’t be scared by the elevation gain, it’s just because there’s a bridge on the route. Here’s option 1. 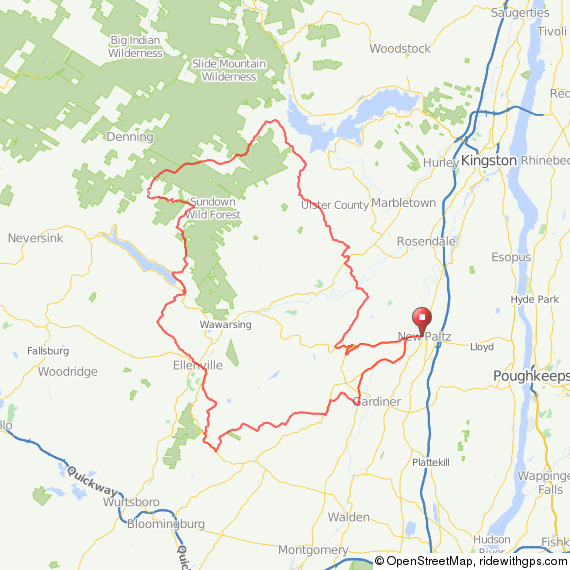 The route, excluding the transport segment to and from New Paltz, is 105 miles. 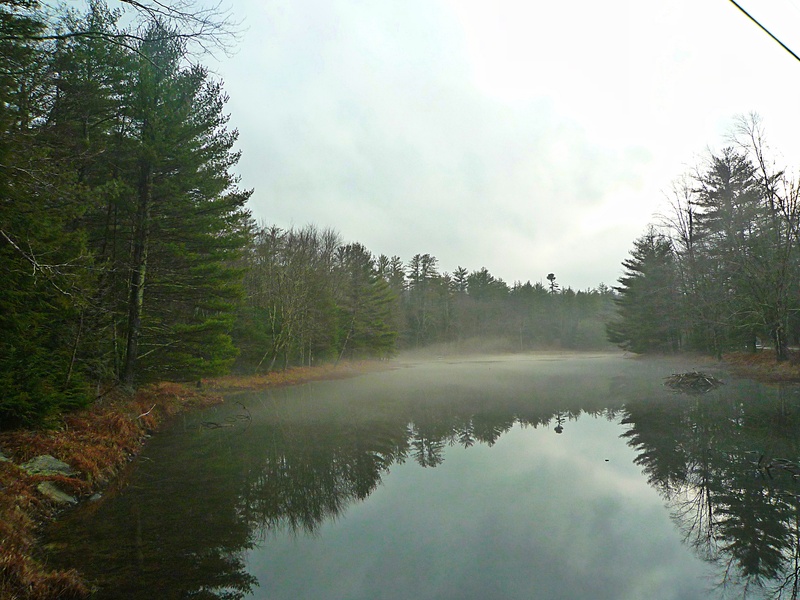 You’ll begin in New Paltz by crossing the river and taking an immediate right on Mountain Rest Road. You can also go straight on 299, but this little jog to the northwest keeps you away from traffic a little longer. 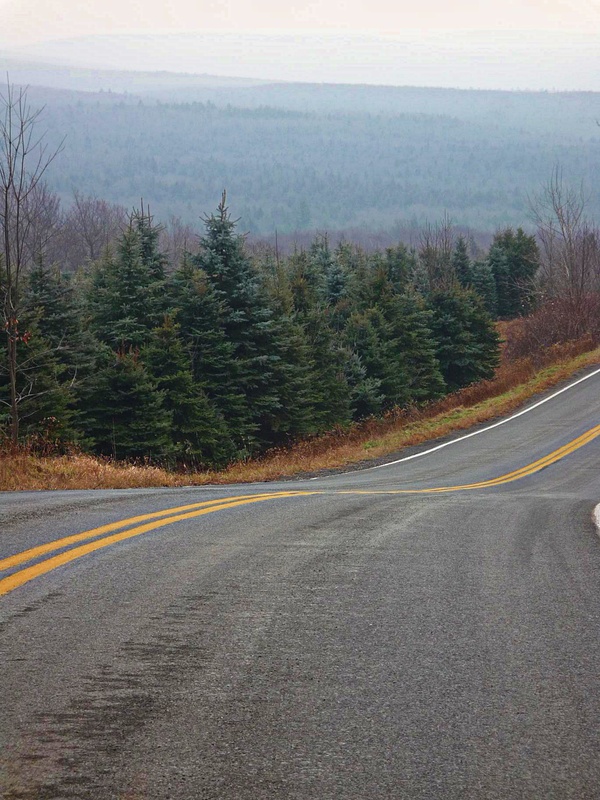 Once you rejoin 299, you’ll head down to a hairpin turn which leads into the climb over the ridge on Route 55. At the base of the climb, you’ll see a German restaurant; across the street there’s a place to fill your bottles or get supplies, if needed. Then, it’s all uphill for the next 5 miles. You’ll encounter some traffic on the way up—everyone is headed to the parking lot at the top of the ridge. 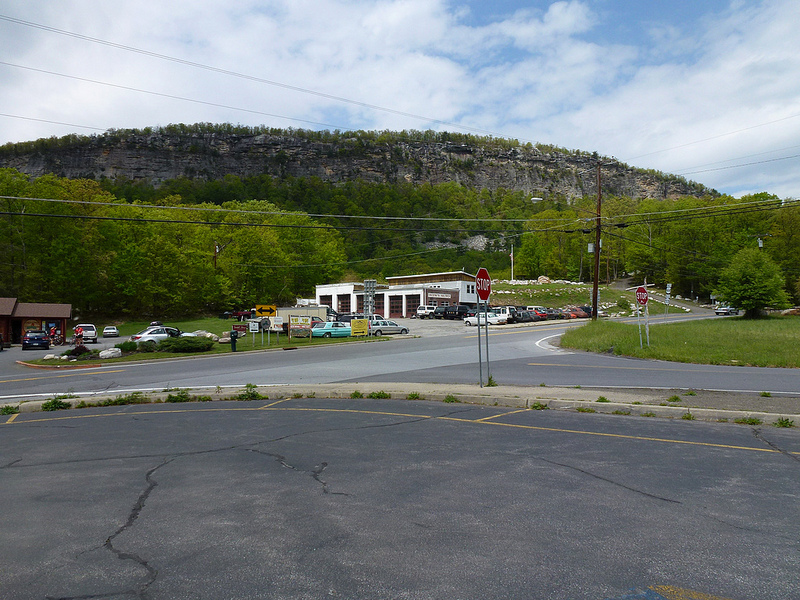 Once you pass that parking lot, the traffic tapers off dramatically and you get to experience a fun 6-mile descent into Kerhonkson. You can either continue onto 209, where there is a convenience store (take a left to rejoin the route), or—as shown on the route—you can take a left on Berme Road, which is considerably more pleasant than 209. Then, it’s on to a very short segment on 209 to take you to Lundy Road. Here, you’ll pass a nice swimming hole if you need to cool off, followed by a right on lovely Rogue Harbor Road. Lundy is extremely rough, and Rogue Harbor is outright gravel. I ride both regularly on a road bike with 25 mm tubulars, so you’ll survive, I’m sure. Now we’re getting to the good part: the foothills of the Catskills. 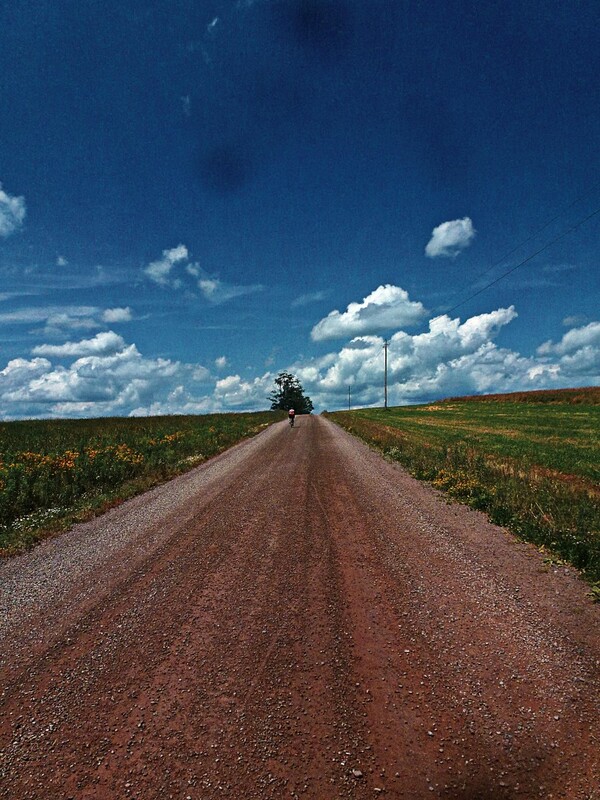 Cherrytown Road is lovely, and you’re going to hit some great gravel on Dug and Sundale Roads. After that, you’ll pass by my house and head into the Catskills. I have to warn you that although the whole section I just described is absolutely beautiful, it’s a long hard slog up a moderate incline. Trust me—I have to do it every time I ride into town! Shortly thereafter, you’ll hit High Point Mountain Road, which will lead you to the second big climb of the day—Peekamoose! It’s a good climb to the top with transient 16% grades, but it is worth it. And here’s the bonus: An 8-mile continuous descent. That’s right, absolutely no uphill—all downhill. Followed by a 13 mile descent with lots of gravel. From there, you’ll follow 55 into Naponach, followed by another brief segment on 209, whereupon you’ll enter Ellenville. Stop for lunch because the worst (and best) is ahead. From Ellenville, you’ll take South Gulley Road back over the Shawangunk Ridge. 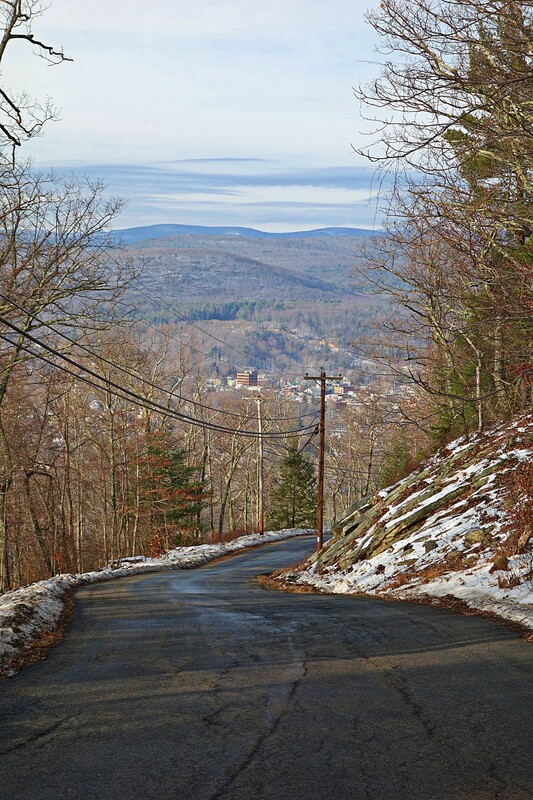 Here’s a view looking down South Gulley in the winter. You’ll be going up, sorry! It’s apparently the biggest vertical climb in the Southern Hudson Valley. 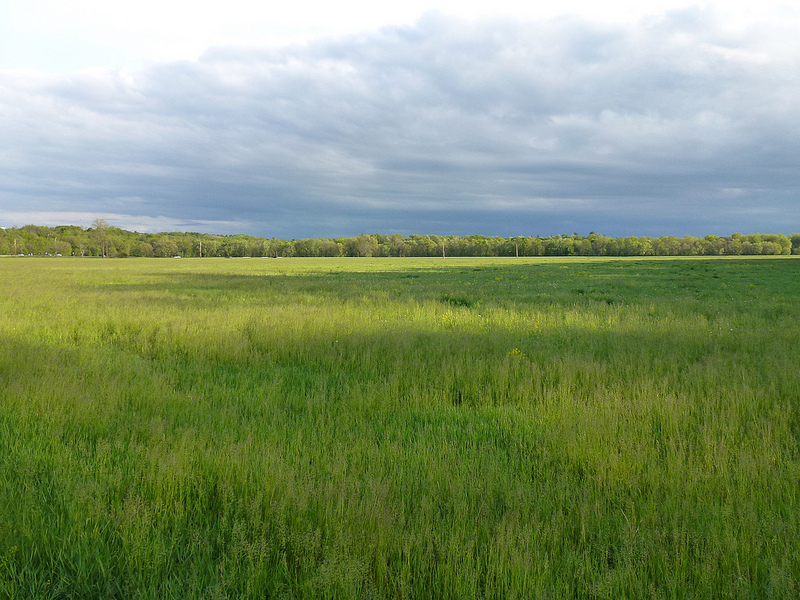 Afterward, you’ll descend on Vista Maria, and from there it’s all rolling farmland and forest back to New Paltz. As you can tell, I endorse Route Number 1. But here are a few more options. Route 2 will take you much the same way, but it is only 90 miles in length. 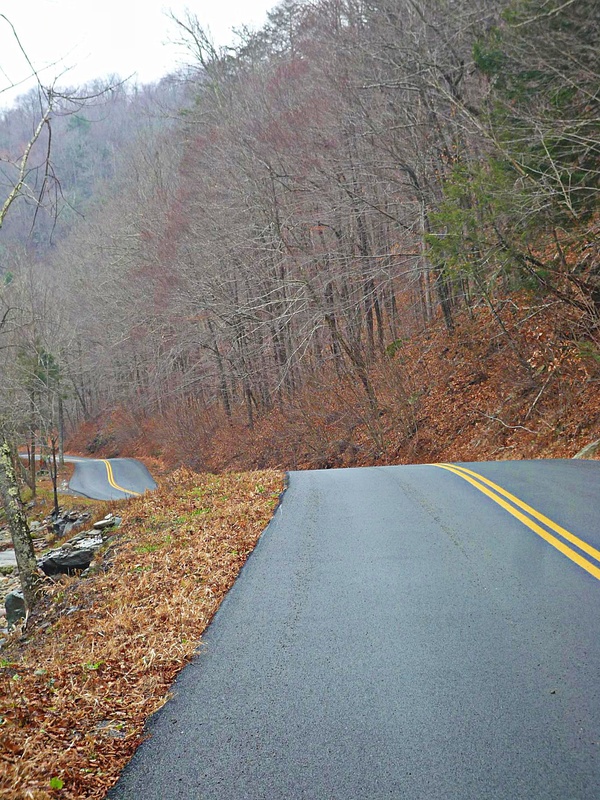 On this route, you won’t climb over the ridge on 55; instead, you’ll take Mountain Rest Road over the ridge. In many ways, this is a better climb than 55, and there is much less traffic, but no views! So for all that struggle you get nothin’ at the top. From there, you’ll head into High Falls, and then up into the foothills…no, there’s no avoiding the slog up to the first climb, but again if you have to struggle you might as well do it in beautiful country, right? 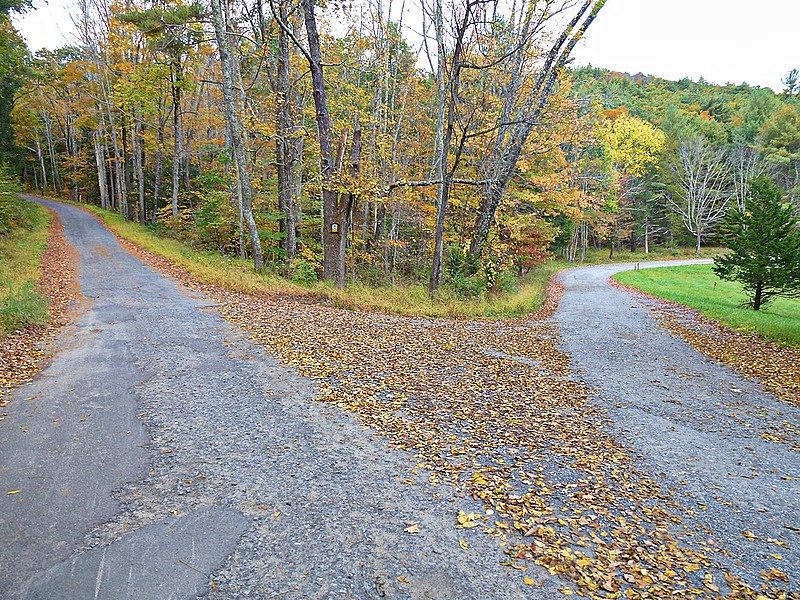 You’ll go over Peekamoose, same as before, but instead of enjoying the second climb, you’ll head straight down onto 55, and then ride in back country to Ellenville. 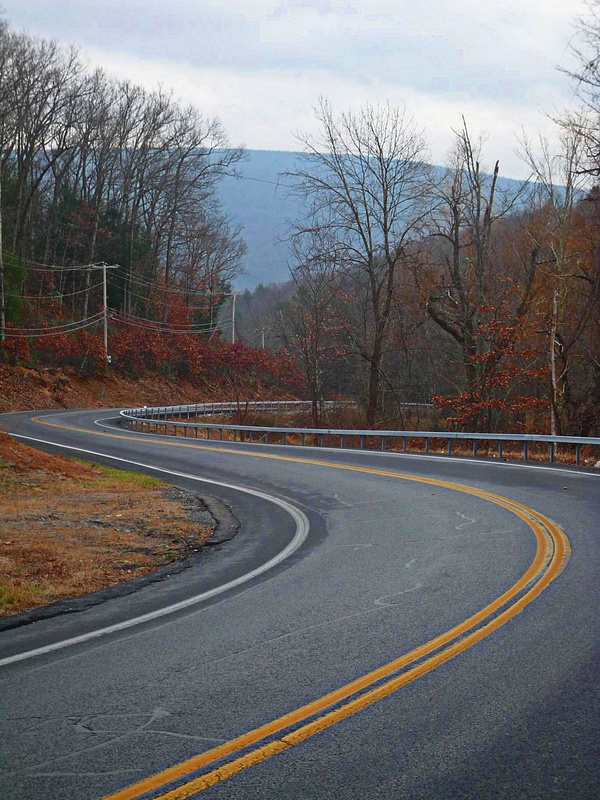 I’ve included a descent on Irish Cape Road just because it’s fun, but it does mean that you have to ride 2 miles on 209 to get back to Ellenville. Do it though, it’s worth it. From there, everything is materially the same. Now, what about Route 3? This ~90-mile route takes you halfway up the Route 55 climb, but then takes Clove Road over, and you ultimately cross 209 to get to the foothills. 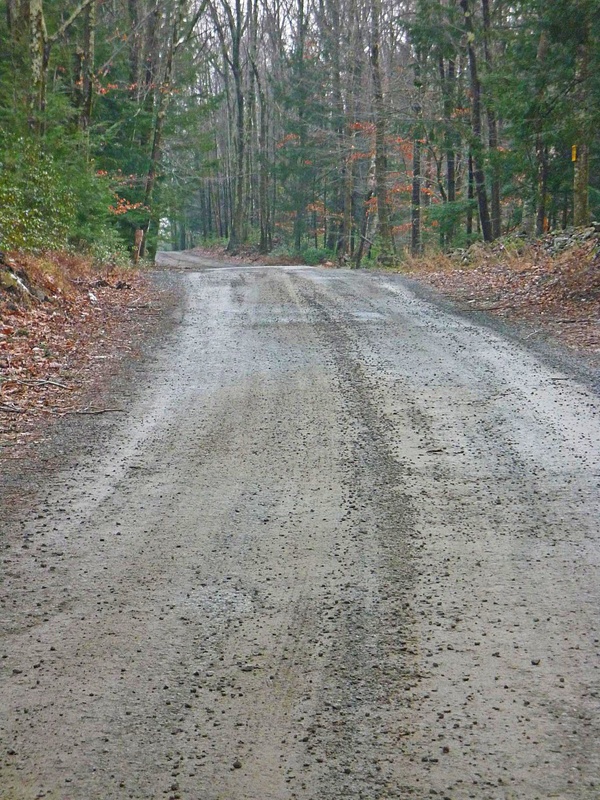 This route includes the second Red Bush/Greenville climb and all the fun gravel. Again, after you hit Ellenville, you’ll be riding up South Gulley, descending Vista Maria, and then rolling farmland back to New Paltz. I’ve covered every inch of these roads on various rides, and you really can’t go wrong with any of them. They will tax even the most experienced rider, but nearly every mile is worth the effort. I say nearly, because there are some very short segments on 209 (which really is much better than 9W, but it is the least pleasant road out here). Altogether, though, out of 90 to 100 miles less than 4 or 5 are on 209. 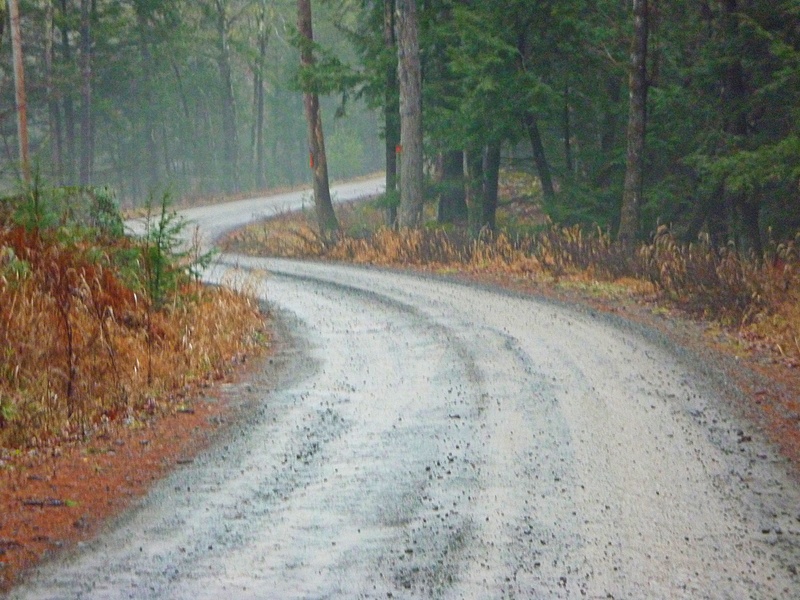 If you need any advice (or encouragement) my contact information is on my professional website…and check back a little later in the week: I’m putting together the Spring Route Roundup right now, and of course I’ll have a ride report for you. 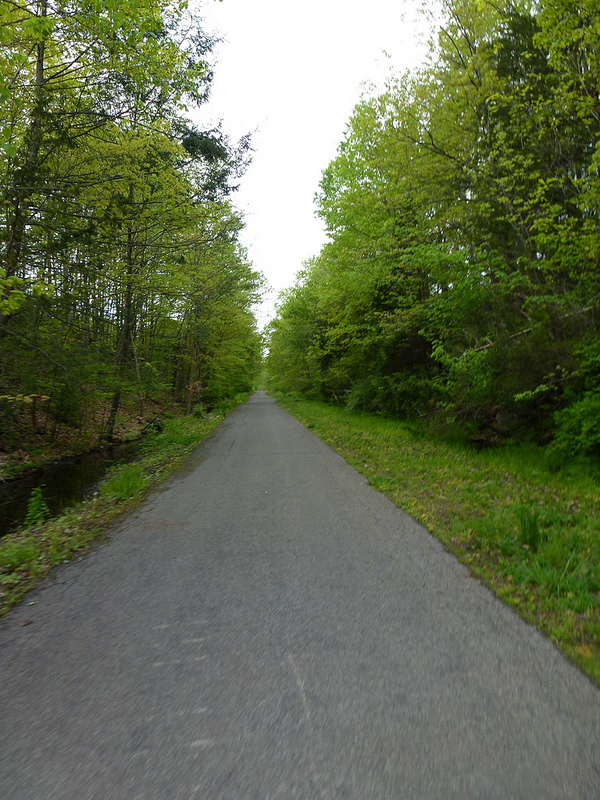 This entry was posted in bicycles, bicycles routes rides, catskills, rides, routes, Worth the trip and tagged Catskills Cycling Bicycle Routes, Cycling photography on April 8, 2013 by John Ferguson.